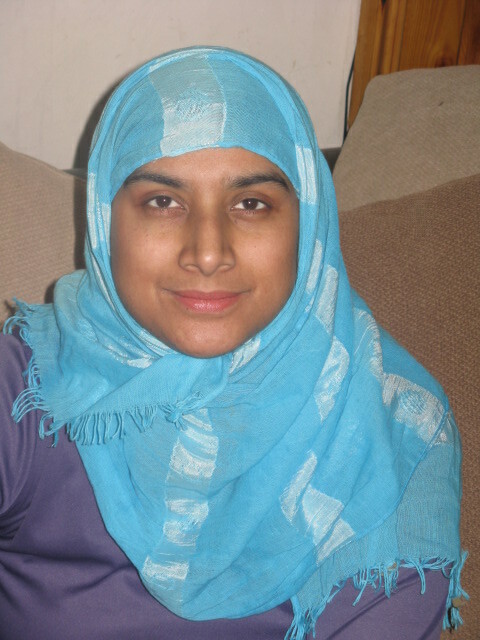 Time to meet another of our lovely sellers. Jennifer creates beautiful, whimsical pieces to treasure. The perfect gifts for special ladies, if ever I saw some! 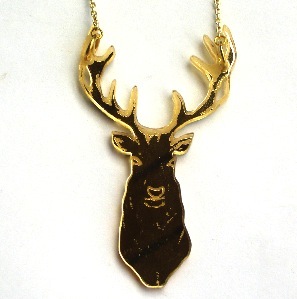 I’m Jennifer, I make lots of pretty things under the name The Midnight Deer. I use vintage items & hand designed perspex, sparkling beads, semi precious stones and charms to make jewellery, hair accessories and other lovely treasures. The majority of my work is either limited edition or one off, making it all the more interesting to make and all the more special to own. How long have you been selling your wares and how did it begin? Or is Craftaganza your first time? I’ve been selling my work under one name or another for several years now. I’d always made jewellery for myself and as gifts for friends/family, one day I tried selling my work online and it went from there really. I’m excited about selling at Craftaganza as it’s a fab location and building. Aside from Craftaganza I can often be found at other local Art / Craft Fairs and am also kept busy selling my work through http://themidnightdeer.bigcartel.com/ along with several other shops which currently stock the collection. Other crafty disciplines you like to practice? When I’m not working on items for The Midnight Deer, I like to draw, paint and play piano – not all at the same time, or possibly. Forests, oceans, animals, music, early mornings, late evenings, nature & night time. One of my local stockists is ‘Handmade’- a shop on St James Street in Brighton which sells art, cards, clothes and jewellery by several of us local designers. I admire anyone who puts their heart to something they love. Thanks for reminding us to spend more time on those three valueable words, Jennifer! I’m not sure how today’s featured seller manages to find time to make her lovely products, but somehow she does and we are very glad to have her on board for Saturday week! My name is Claudette Fernandes, a busy mum of 7, who loves to craft with both new and reclaimed products- from fabric to old books. 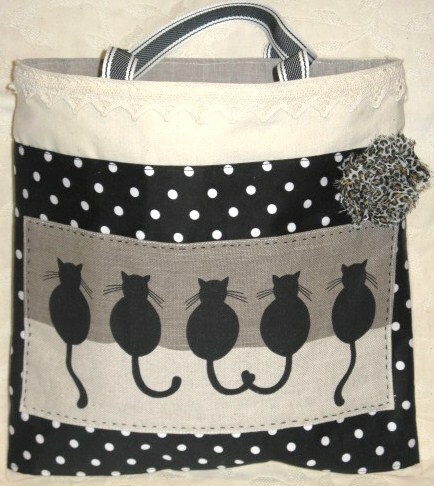 I make a medley of wares, because I am always taken in new directions- I make bags, baby bibs, quilts, clothes. 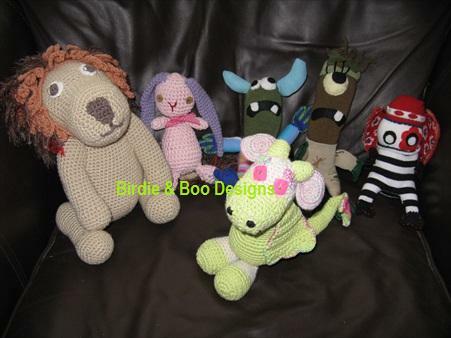 I also love to crochet, particularly amigurumi toys although I am not averse to making other crochet goodies. 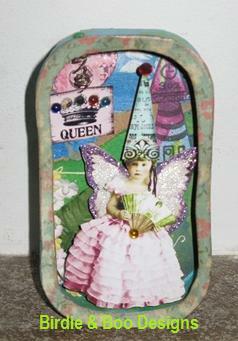 In addition I make altered art giftware, particularly shadow boxes. I have always had a love for crafts, I think it is in my blood, both my sister and mother are fiendish crafters. I started making and selling casted models over 20 years ago. At about the same time I taught myself how to sew and then moved on to making jewellery until I ended up where I am today. I have been selling my wares for a long time but it has mainly been a hobby until comparatively recently. 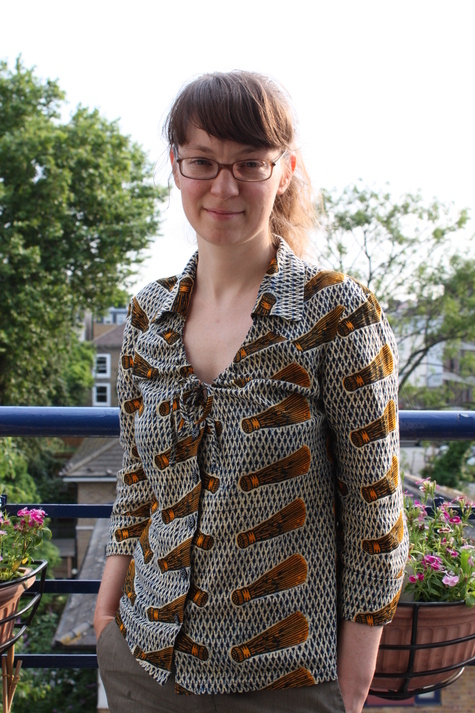 With the encouragement of family and friends I have decided to take it a step further and am presently busy creating my website www.birdieandboodesigns.com and teaching sewing and crochet classes; I have also been trading in a market in south west London. But Craftaganza is my first craft fair and so I am quite excited! I love to make cards & gift tags and am not averse to a bit of knitting. 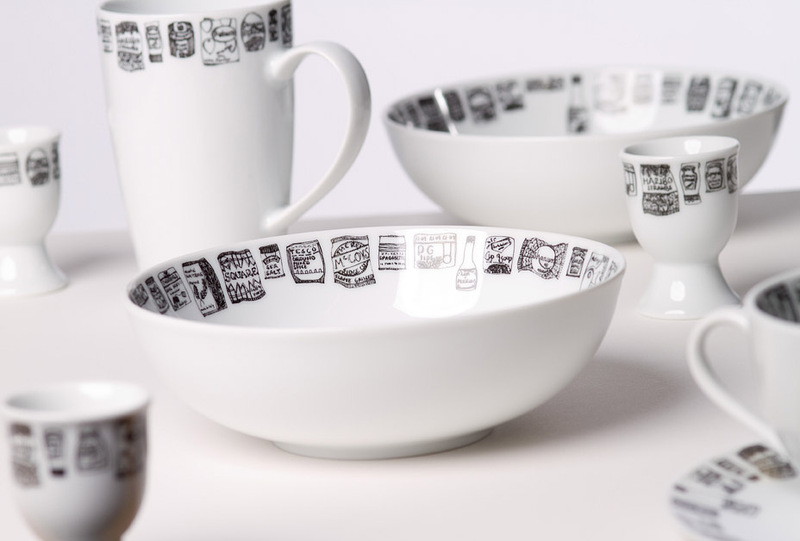 On my wish list of things to learn would definitely be screen printing and silversmithing. Nature but also everyday things like a coffee shop, architecture and paintings. Amy Butler & Anna Maria Horner their creativity are truly inspiring. But not forgetting our very own Lisa Lam – she started me on my bag making mania and is the reason why my house is stacked to the rafters with fabrics, buttons and other bag making paraphernalia. Work hard and never give up – you will be rewarded in the end! Can’t wait to see the full range of her products very soon. Thanks for taking the time to show us a sneaky peak, Claudette! I’m very excited to introduce to you today a lady who clearly shares my own obsessions with sewing and vintage/reappropriated fabric. 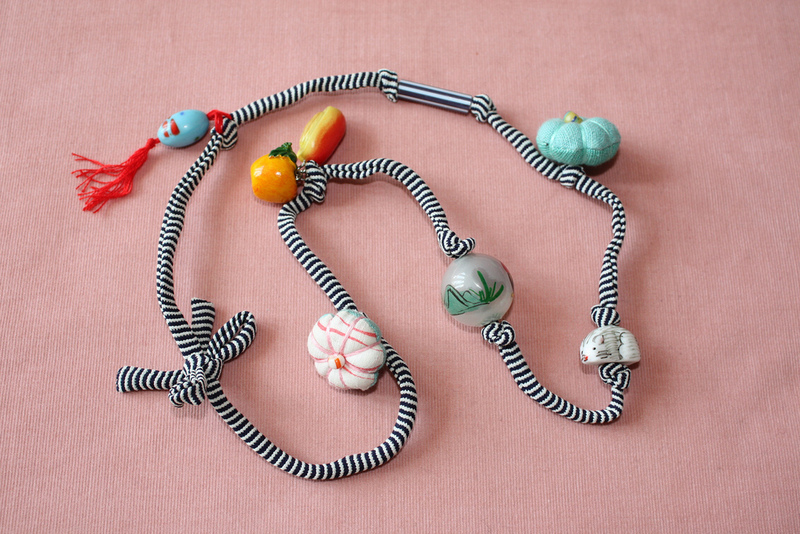 I can’t wait to see her creations up close and in the flesh at the fast approaching Craftaganza! Hello! My name is Katy Robbins. I make and sell things under the name of Bobbins & Robbins. 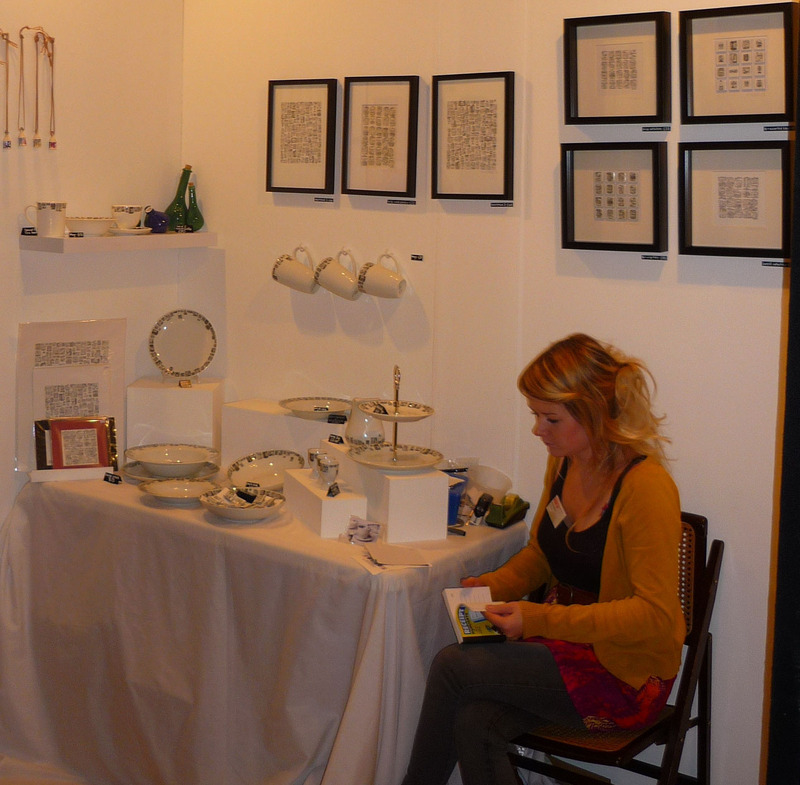 I started selling my wares at Handmade Brighton’s Christmas Fair last year. I really enjoyed the experience and can’t wait for Craftaganza. I’ve always enjoyed sewing. As a young teen, I turned my jeans into flares, stitched pillows and bags and later on, ball gowns. My mum gave me a dressmakers dummy for my birthday last year and that’s when I realized I could start making clothes for other women. I love the way clothes feel and look when they fit properly and I really want to share that with others. I want to make it a luxury that women can afford. I can knit but I’m not very dedicated towards it. I started knitting a tamoshanta last November (2009) and there’s been no progress on it! My sewing machine usually distracts me. 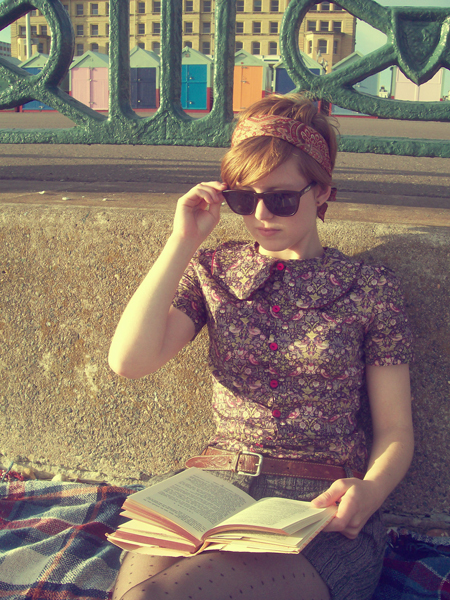 I’m besotted by vintage fashion and thoroughly enjoyed delving in to vintage fashion books to find ideas for the clothing range. I love the feeling of made-to-measure clothes and that has inspired me to share that with others. I really enjoy British Wildlife and British heritage so I had to make the tweed badgers and rabbits. Looking forward to the warmer months ahead and all the adventures I hope to have has encouraged me to make the bags, something fun to stash a packed lunch and my sketchbook in. I admire anyone who can make something, anyone who puts time and effort in to creating beautiful and useful things. Brighton’s a fantastic place for hands on creativity. It’s that creativity which makes Brighton such a fun and unique place to be. 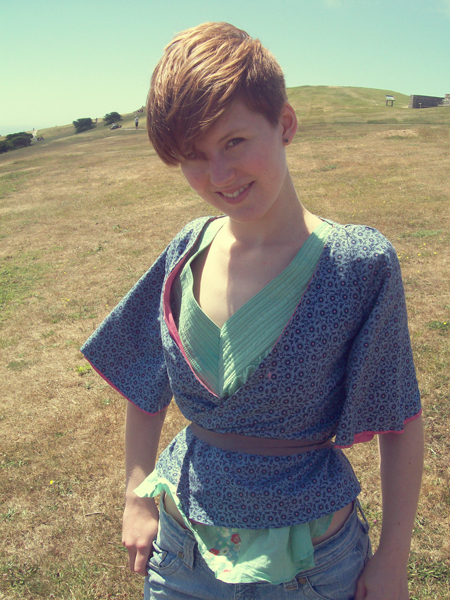 I shared a stall at Handmade Brighton with Esther Springett of Cuffs and Ruffs. Esther makes gorgeous cuffs with the neatest detailing I’ve ever seen, out of fantastically fun fabrics. They’re such a clever idea and will jazz up any outfit in a jiffy. I love the make do and mend philosophy of the wartime era. I always try to use recycled fabrics and get a buzz out of creating something new, useful and pretty from something you would have ordinarily thrown out. I love the challenge of finding second hand fabrics with wonderful patterns. As William Morris said, “Have nothing in your house that you do not know to be useful, or believe to be beautiful”. Thanks Katy! 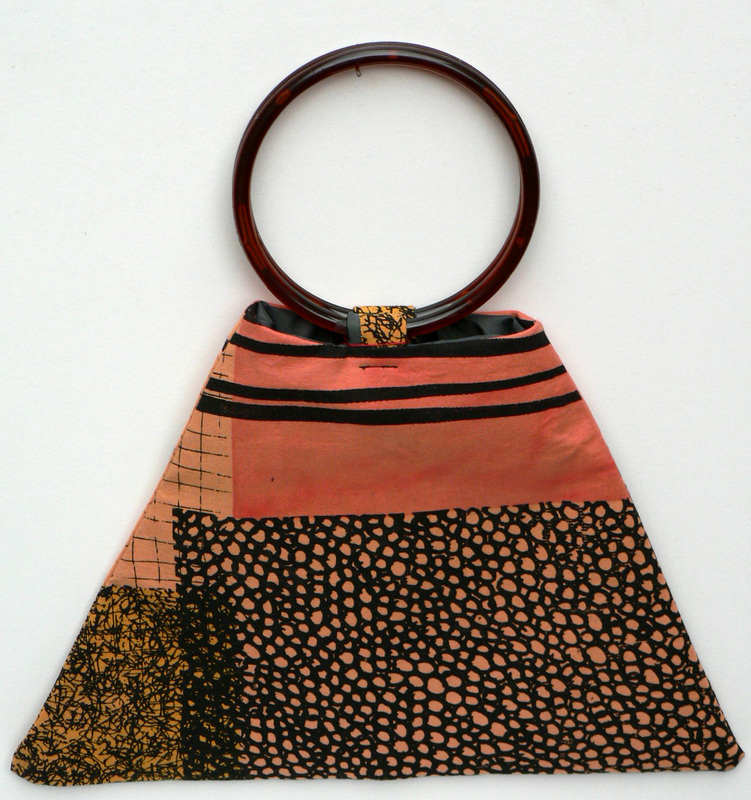 Check out her beautiful site for a taster of what to expect on the 26th at Craftatganza. 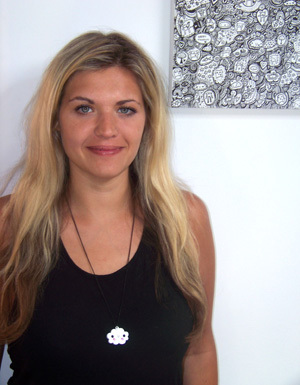 Let’s meet another lovely local creative talent: the multi-disciplined talent that is Laura from Not Nice Laura! Screen printed fashion and home accessories, framed prints and cards as well as commisions for anything from wall hangings to wedding invites! As an art teacher I get to try out lots of different interesting techniques, print-making, ceramics, sculpture etc. 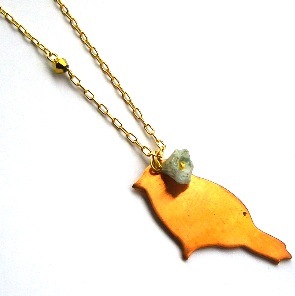 I make jewellery sometimes too. I’m inspired by the 1950’s the work of Lucienne Day etc as well as my own drawings of landscapes, natural forms and buildings. I’m interested in printmaking and illustration so Im always interested and inspired by people working in that field. 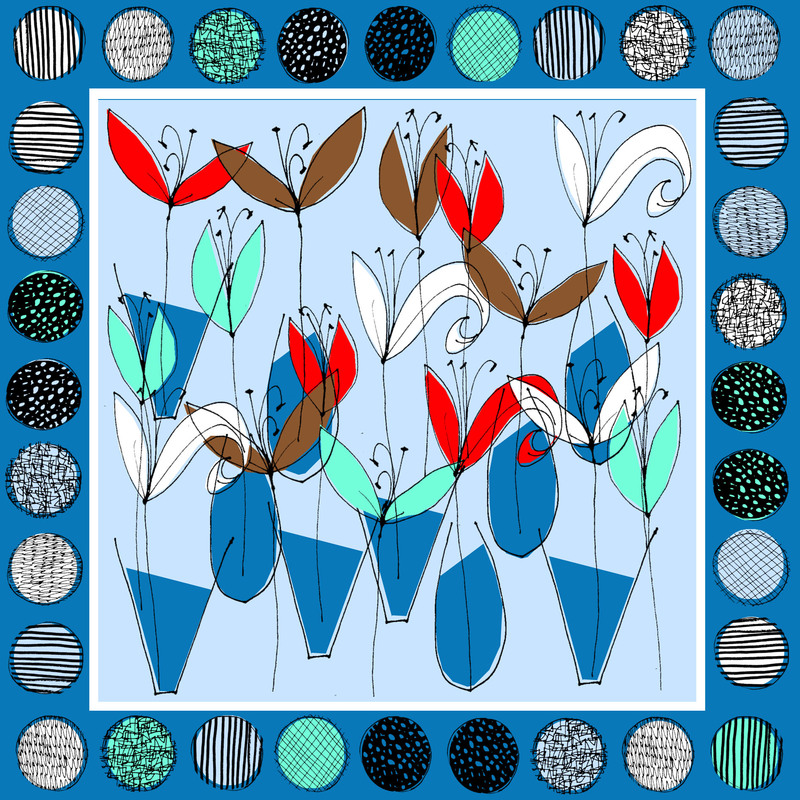 I like Cressida Bell’s and Angie Lewin’s work and lots of the textile designers work on etsy etc. 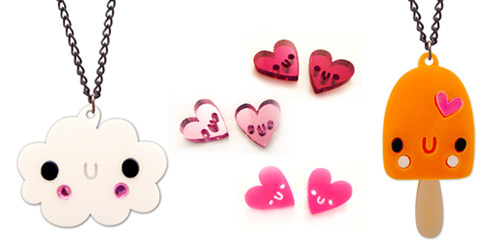 Hi, my name is Carrie Lewis and I’m a doodler, jewellery maker and accessories designer from East Sussex. 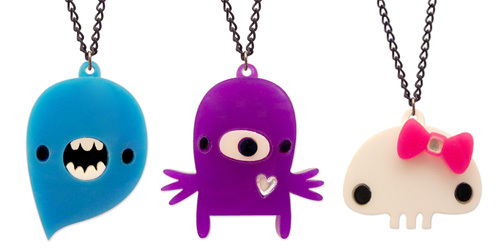 Currently, I have a handmade acrylic jewellery range called ‘Doodllery’ which is based around some of the cute little characters that started their lives out as scribbles in my sketchbook. They’ve got a hand drawn, kawaii personality about them. 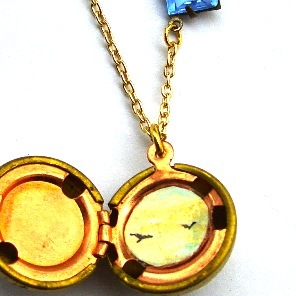 The jewellery is fun and unique, and I like the idea of giving people a little companion to share their day with. I’ve been doodling for a fair few years now, but only brought out my Doodllery range at the start of last year. I’ve only been selling online up until now – Craftaganza is my first fair out in the real world! I also design quirky bags, gifts and accessories for a large UK wholesaler and you’ve probably seen a few of my ranges around Brighton. My ‘Wagtail’ and ‘Sugar Coated’ ranges both prominently feature my doodles. 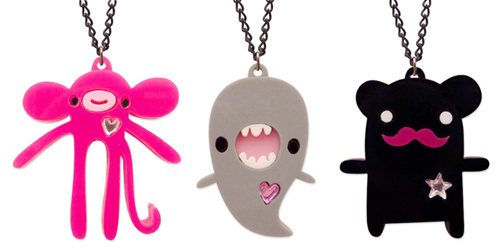 I also run an online shop called Little Moose which focuses on cute characters and fun kawaii products. I love anything that is cute, small and makes me smile. There are so many talented artists out there and my house is full to the brim with cute things that people have created. Some of my favorites would include Depeapa, Made by White, Lazy Oaf and MaryMary Handmade. Think happy thoughts, smile and love anything that is colourful and cute. Hmm, I think my favourite has to be the pink monkey. No, the grey whale, oh, I don’t know! What about you?! We met today’s ‘Meet The Seller’ subject, Martha Mitchell, at MADE10 back in November, where she was selling her incredible ceramics. The quality and refinement of her work is incredible, particularly considering she graduated only two years ago! Plus, her egg cups make me smile every time I look in my cupboard! My names Martha, I set up my business Martha Mitchell Design last year, I now share a studio in Hove with Lizzie Lock a milliner, and Rebecca Cluett a fashion and textile designer. I graduated from Nottingham Trent University 2 years ago with a degree in decorative arts. 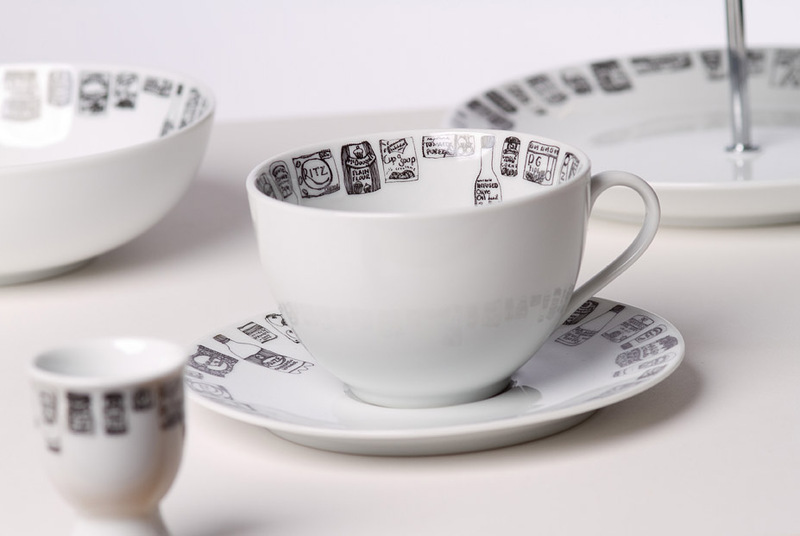 I design and make a selection of home wares from cakestands to tea towels, each item is decorated with intricate fine line drawings of popular food packaging! I began selling my products about 18 months ago, I was chosen from university to have a stand at a craft fair called ‘Lustre’ in Nottingham – It was there that I realised designing and making my own products was what I wanted to do! I have done a few craft fairs since then including MADE, and the Islington Art and Design Fair. But this will be my first time at Craftaganza! 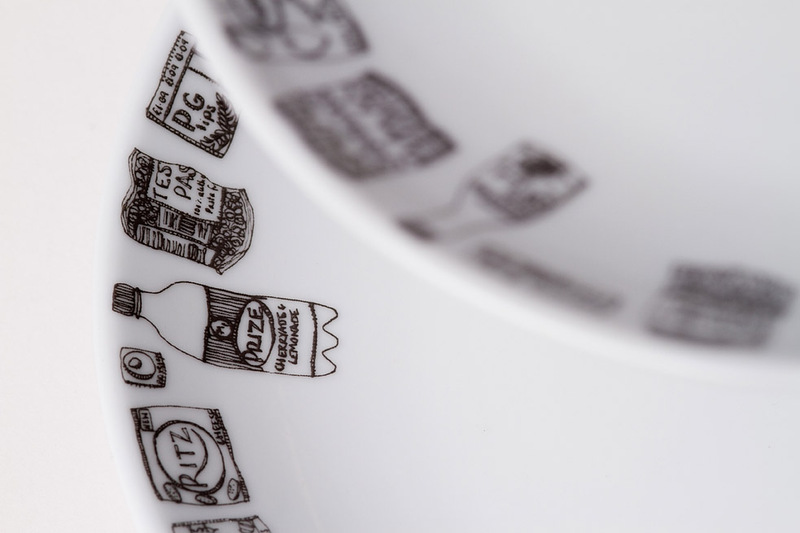 I sell my products trough various online outlets including my own website, Notonthehighstreet, and Mydeco. 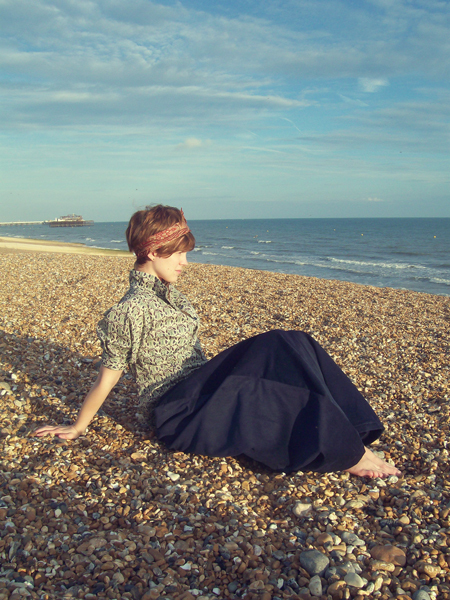 I also sell my products through galleries and shops in Brighton and London. Other crafty discipline you like to practice? I can never find any greeting cards I like so I like to make my own! I am hoping to design a range to sell in time for craftaganza! I have always loved packaging and multiples, I started drawing sweets and crisps packet and then couldn’t stop! I often go into newsagents and sweetshops to draw. I really admire the work of the designer Andrew Tanner, he was a visiting lecturer at university and I found him really inspiring. If ever there was a motto I should probably adopt, it’s that one! Thanks Martha! It is my very great pleasure to introduce to you today one of my absolute favourite crafters out there: Michelle! I met Michelle about four years ago when we were both in a sewing group together, and have been friends ever since. 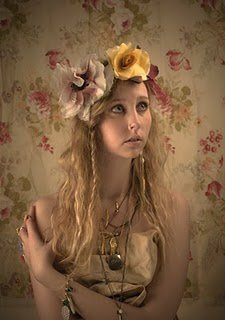 She has a truly distinct style which, when combined with her insane attention to detail make for seriously fabulous creations. You can see her latest projects and the inspiration that drives her on her blog, and check out her fantastic creations over at her etsy store. My name is Michelle Jensen, I am a self taught sewer and crafter of jewellery, accessories and home wear. I started sewing about ten years ago and instantly felt like I’d found a way to let myself be creative and play. Originally hailing from East sussex, I currently live in London and take inspiration from all the amazing exhibitions, galleries, markets and beautiful places. The products I make are often very colourful and whimsical. 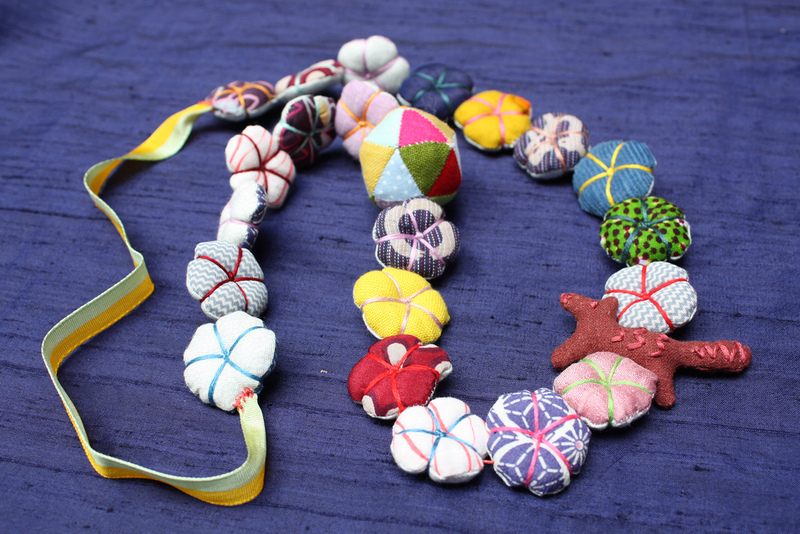 I love to make jewellery out of fabric and I’m naturally drawn to small things. I make brooches by stuffing a sewn shape then quilting it with decorative machine stitches. My necklaces are made with a mix of sewn ornaments, found items and beads. Each one is a unique talisman! I also enjoy making wall art, and home wears using patchwork, appliqué and machine embroidery techniques. Fabric is wonderful medium to work in because it suggests itself to certain ideas and uses. I’ve been selling on etsy for about a year and have sold work in an exhibition in New Zealand and at an ‘open studio’ event in London. This will be my first craft fair so I’m really looking forward to seeing how it goes! I started trying to sell the things I make because there are only so many times you can give them as gifts before you run out of people to give them to! I enjoy clothes making for myself and family members and occasionally do a bit of knitting. 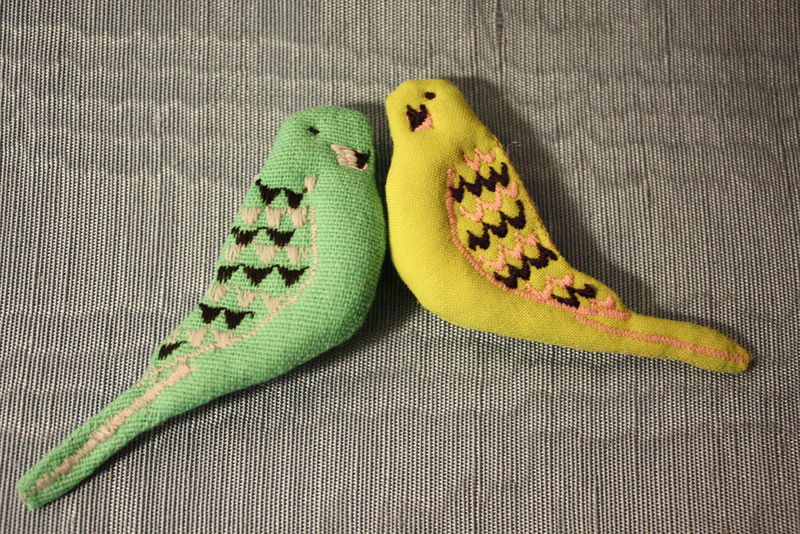 I also sew creatures or dolls, but haven’t been able to bring myself to sell these yet as they seem alive to me! In the past I have practiced paper making and bookbinding, and if I had all the space and time in the world I would love to combine this with collage to make journals and notebooks. I’m inspired by nature and urban life in equal measure and I enjoy design that makes people smile. I’m also inspired by Japanese and Native American aesthetics, but also by folk and outsider art. I basically love bold colour and pattern. I tend to let myself be drawn to certain colours and shapes, and let ideas spring from them. A little nonsense now and then is loved by the wisest men! Thanks Michelle! I know for a fact that she has been stitching up a storm in preparation for Brighton Craftaganza, I can’t wait to see what her imagination has come with!